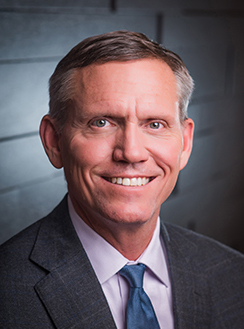 John T. Thomas is our President and Chief Executive Officer and has served on our Board of Trustees since August 2013. Mr. Thomas was the Executive Vice President-Medical Facilities Group for Welltower Inc. (NYSE: WELL, formerly known as Health Care REIT Inc.) from January 2009 to July 2012 where his group was responsible for growing total net investments for the company’s medical facilities division, including hospitals, medical office buildings, and life science research facilities, from $2.3 billion in assets to approximately $5 billion. During that three and a half year time frame, Mr. Thomas’ group expanded WELL’s medical office building portfolio from 128 properties to 210 properties with rentable square feet growing from 5.6 million to 13 million and the percentage of medical office buildings affiliated with healthcare delivery systems growing from 62% to approximately 90%, while occupancy for the medical office buildings improved from 90% to almost 94% during this period. The medical facilities division’s annualized net operating income increased from $131 million in 2008 to more than $350 million while Mr. Thomas led WELL’s medical facilities division. From July 2012 to July 2013, Mr. Thomas was self-employed as a healthcare consultant and lawyer. Mr. Thomas has relationships with over 25 national operators and healthcare delivery systems with whom he has worked to develop and acquire healthcare facilities occupied by these healthcare delivery systems and operators. Mr. Thomas also served as President, Chief Development Officer and Business Counsel of Cirrus Health from August 2005 to December 2008, where he led efforts to acquire and manage four hospitals and an endoscopy center, as well as efforts to develop other facilities. From October 2000 to July 2005, he served as Senior Vice President and General Counsel for Baylor Health Care System in Dallas, Texas. As General Counsel for Baylor Health Care System, he was responsible for legal and government affairs. Mr. Thomas has been recognized for his team’s advocacy work on Texas H.B. 3 and Proposition 12, the 2003 Texas legislative and constitutional amendment efforts to increase patient access to physicians and care through reforms to Texas’ medical malpractice laws. He was also co-founder and chairman of the Coalition for Affordable and Reliable Healthcare, a national coalition to reform medical malpractice laws through federal legislation. Mr. Thomas has testified before the Ways and Means Committee and Energy and Commerce Committee of the U.S. House of Representatives and a sub-committee of the U.S. Senate’s Homeland Security Committee, all related to health care policy. From April 1997 to October 2000, he served as General Counsel and Secretary for Unity Health System, a five-hospital division of the Sisters of Mercy Health System in St. Louis, MO, where he oversaw legal affairs for the healthcare delivery system and its operating subsidiaries. Mr. Thomas has served on the Board of Directors of Education Realty Trust, Inc. (NYSE: EDR) since September 2016. He is the chairperson of its Compensation Committee and a member of the Investment Oversight Committee. He also serves on the Board of Trustees for the Jacksonville State University Foundation. Mr. Thomas began his career as a tax lawyer at Milbank, Tweed, Hadley and McCoy in New York, NY in 1990, and was elected a partner at Sonnenschein, Nath and Rosenthal (now Dentons) in April 1997. Mr. Thomas received his J.D. from Vanderbilt University Law School and his B.S. in Economics from Jacksonville State University, where he was a scholarship letterman on the football team and was a member of the Academic All-Conference Team. Mr. Thomas graduated with Distinction and Special Honors in Economics.